6:48 AM marked the opener of the MN Winter Trout Season. I headed out to Lake Cenaiko with a few friends and my son to experiece what is an annual ritual for dozens, if not hundreds of MN anglers. The gates opened around 5:30 AM with about 20 cars lined up. The guy at the gate said previous years have seen lines all the way out to the park entrance. By 6:30 AM there were hundreds of portable shacks set up with anglers chomping at the bit to get their lines in the water. We set up our Frabill Headquarters Hub for the first time. It was instantly christened "The Shangri-La". We could fit a small army in this shack but this morning it ws just an army of me and my son. My inaction was interupted by some hooting and hoolering from about 100 ft to my north. 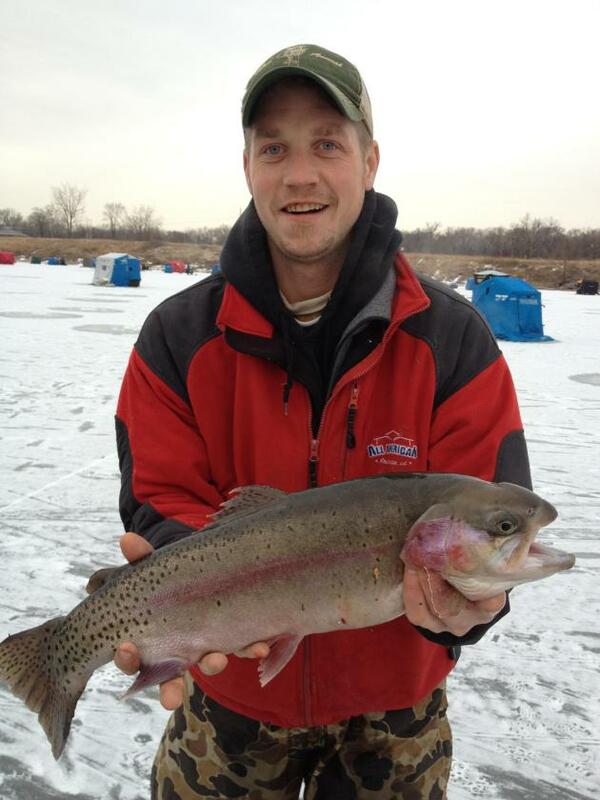 Aaron Dreyer from Elk River hooked into a 22.5" beauty. He fought the fish for about 5 minutes making sure not to break his 2# test line. While I was distracted taking pictures and talking to Aaron about his big catch my buddy Matt Bistodeau was busy putting fish on the ice. By mid-morning he had three around the 15" mark. My son Theo was getting a little bored and I wasn't far behind him but we kept our lines in the water and hoped for a bite. We had something hit both our lines but neither of us hooked it. 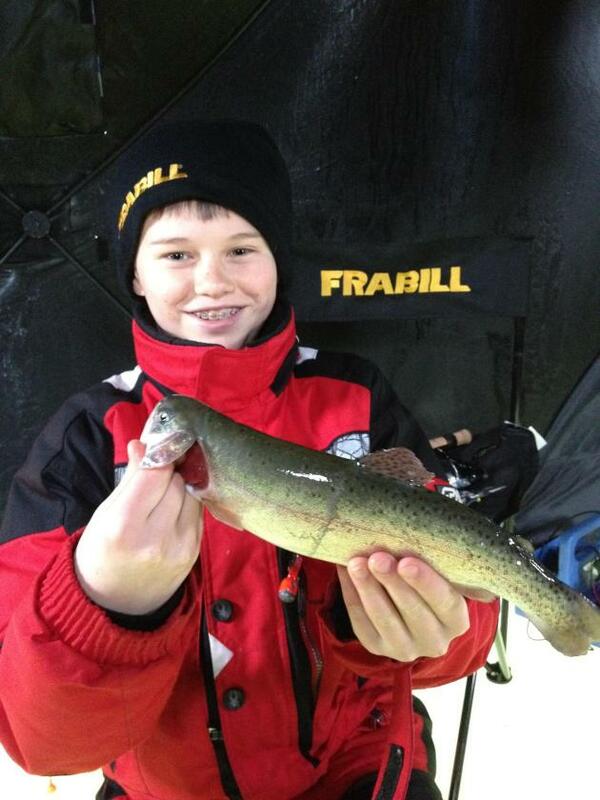 A few minutes later Theo picked up a blip on the Vexilar and hooked into his first rainbow trout. A brief battle ensued with Theo winning the fight. The trout is now resting comfortably in our freezer until tomorrow afternoon when we'll cook it up for lunch! 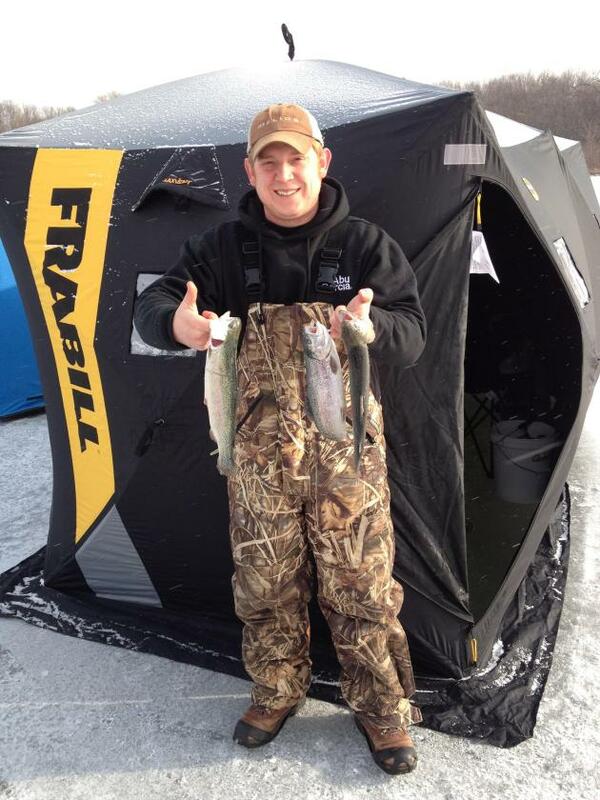 Most anglers were heading off the ice by mid-morning. We cut out about 11 AM but will definately be heading back. The season runs through March 31 with angling from 1 hr before sunrise to 1 hr after sunset. It's a stocked pond with over 3000 fish released this year. As Aaron proved this morning there are some slobs swimming around. No live bait is allowed other than maggots. It costs you $5 to park and $10 for a MN State Trout Stamp. Great-affordable fun for the whole family. See you on the ice! Watch Outdoor Television Awards LIVE!